I got an ATV series (it(s from 1979, so, maybe it's a RTV series) called Operation Manhunt. 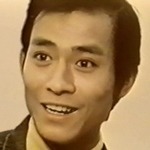 I discovered that Shaws' actor Wang Chung played in it, and also this actor Philip Chan Yan Kin, who is a familiar face in many movies to me, but I didn't know who he was until looking for informations on this series in order to see how many episodes it has, because what I got only has 8 episodes and is mentioned as " Operation manhunt I ", so, I guess that there lust be a part II. So, while looking for these informations, I found that Philip Chan was a former CID officer before becoming an actor, and that he directed many police-action movies !